The most common primary intraocular tumor of both cats and dogs is melanoma typically presenting within the iris and/or ciliary body. In dog, ocular melanoma presents as a solitary lesion with a low potential for metastasis. In contrast, feline ocular melanoma is typically a diffuse lesion within the iris with a greater propensity for metastasis. In either case, early recognition (and removal of the eye if necessary) can prevent glaucomatous pain and metastases associated with ocular melanoma. There are three forms of melanocyctic neoplasm appreciated in dogs. A benign melanocytoma typically presents an isolated nodular mass (Figure 1) made up of deeply pigmented large round cells and similarly pigmented spindle cells. The second form is a benign limbal melanoma presenting as a slow-growing mass originating from pigmented cells of the limbus. Both melanocytomas and limbal melanomas may compromise the health of the globe, but they do not typically metastasize. The third form is a malignant ocular melanoma. Its cells have all histologic features associated with malignancy, yet few will metastasize in the dog. Tumors of all three forms that are removed via enucleation have a low incidence of reoccurrence. In the dog, an early melanocytoma or limbal melanoma (where the mass is less than two to three “clock hours” in size and without invasion of the drainage angle) can usually be successfully resected and/or ablated with a diode laser. Larger masses are typically associated with intractable glaucoma, uveitis and blindness. Enucleation is warranted in these cases, following a radiographic survey of the chest and an abdominal ultrasound to scan for metastases. In the dog, an untreated ‘benign’ melanocytoma may continue to grow, rupture from a globe, and invade a surrounding orbit. In cats, ocular melanoma initially presents as focal or multifocal areas of uveal pigmentation. These superficial areas confined to the surface of the iris are known as “iris freckles” or nevi. Nevi will increase in size, or number, and “transform” into feline ocular melanoma. Feline melanomas often appear as dark mink-brown (Figure 2) or infrequently golden-brown diffuse and multifocal lesions. There are even very rare cases of amelanotic feline ocular melanomas. Aspiration of these lesions in cats is seldom diagnostic as these melanomas do not usually exfoliate cells. Diode laser ablation is often an ineffective treatment for these melanomas due to their diffuse nature allowing for recurrence and metastasis of non-ablated lesions. In cats, an area of extraneous iris pigmentation is not always coupled with melanoma. However, pigmented areas with a predilection for malignant transformation are usually associated with a distorted surface of the iris or pupil, a rapid change in size, pigmented cells within the anterior chamber, and/or elevated intraocular pressure. The progression of feline diffuse iris melanoma is also highly variable. There are documented cases of slow progressions over 10 years, and other cases of rapid progression to glaucoma, metastasis, and death. The rate of progression can tracked with photographs taken during habitual re-examinations. Any area exhibiting characteristics typical of malignant transformation will necessitate enucleation. In a retrospective study, cats that were enucleated prior to developing secondary glaucoma as a consequence of uveal melanoma, had similar mortality to unaffected cats. Therefore, enucleating feline eyes prior to the advanced signs associated with ocular melanoma can save feline lives. As with any ocular cancer, preoperative chest radiographs and abdominal ultrasound scanning for metastases are recommended prior to enucleation. To confirm ocular melanoma, an enucleated eye of a dog or cat should be subjected to histopathology by the Comparative Ophthalmology Pathology Lab of Wisconsin (COPLOW). This lab has the most experience with, and have written most of the literature concerning, melanocytoma and melanoma in the dog and cat. If histopathology indicates that there has been probable metastasis from globe, the enucleated patient can then be referred to a veterinary oncologist for melanoma vaccination. It is often difficult for an owner to enucleate an eye of their pet, even when a potentially lethal cancer has been diagnosed within it. 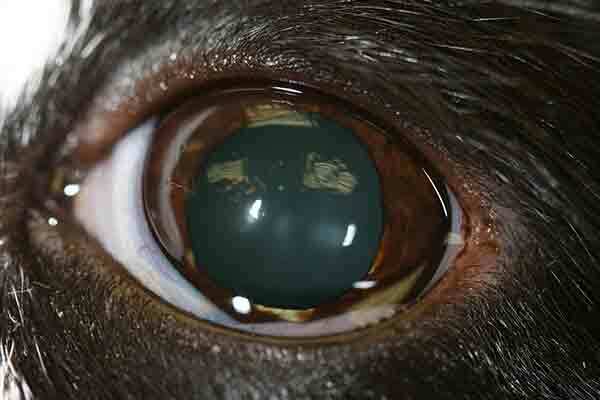 It is important for veterinarians to compassionately convey the necessity of such an enucleation. A client will then often be grateful that an enucleation prevented pain in, and /or saved the life of, their pet. If you have further questions concerning ocular melanomas, please feel free to consult with a veterinary ophthalmologist. 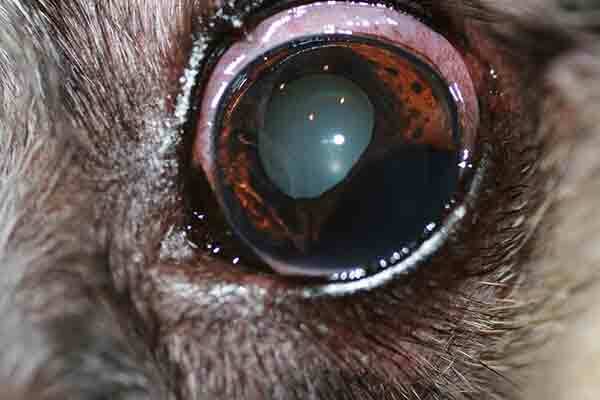 Figure 1: Preoperative iris melanocytoma in the left eye of an 11-year-old spayed female dog. Figure 2: Diffuse iris melanoma in the left eye of a 15-year-old castrated male cat.